Ganoforum presidium member Mokabbir Khan on Tuesday (Apr 2) took oath as a member of the 11th Jatiyo Sangsad. 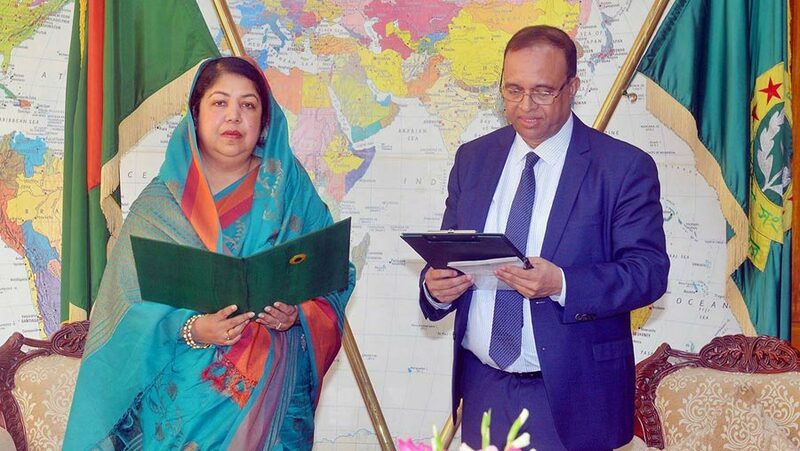 JS Speaker Dr Shirin Sharmin Chaudhury administered the oath of office to Mokabbir Khan elected from Sylhet-2 constituency at the JS Bhaban in Dhaka, local media reported. JS Senior Secretary Dr Zafar Ahmed Khan conducted the oath taking ceremony while Chief Whip Noor-E-Alam Chowdhury, Whips Iqbalur Rahim, Mahbub Ara Begum Gini and Abu Sayeed Al Mahmud Swapan, among others, were present at the function. Another MP of the Ganoforum Sultan Monsur, former vice-president of Dhaka University Central Students’ Union (DUCSU), also took oath on Mar 7. He was elected from Moulvibazar-2 constituency. Opposition alliance the Jatiyo Oikyofront, comprising mainly the Bangladesh Nationalist Party - BNP and the Ganoforum, secured just eight seats in the 11th parliamentary polls held on Dec 30 last year. BNP bagged six seats while Ganoforum two in the elections.